Home » buy_with_confidence » GIMP Image Manipulation Program Great Alternative to Adobe Photoshop + Bonuses!! GIMP Image Manipulation Program Great Alternative to Adobe Photoshop + Bonuses!! This listing is for One Brand New GIMP Image Manipulation Program Installer Disc for Windows with Bonus Programs Listed Below. 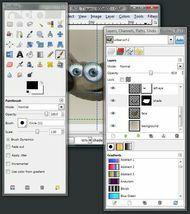 Gimp is A Great Low Cost Alternative to Adobe Photoshop! I will be sending the Windows Version of GIMP unless notified after purchase that a Mac OS X Version is needed. GIMP is also compatible with Many Mac OS X Versions. Please message me after purchase with your exact version so I can provide the correct installation disc. Mac OS X versions required: Tigerè10.4.11 Leopardè10.5.7 Snow Leopardè10.6.4 Lionè10.7.0 Mountain Lionè10.8.0 Introduction to GIMP GIMP is an acronym for GNU Image Manipulation Program. 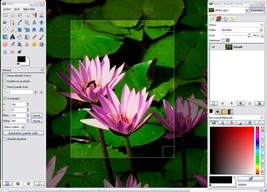 It is a program for such tasks as photo retouching, image composition and image authoring. It has many capabilities. It can be used as a simple paint program, an expert quality photo retouching program, an online batch processing system, a mass production image renderer, an image format converter, etc. GIMP is expandable and extensible. It is designed to be augmented with plug-ins and extensions to do just about anything. The advanced scripting interface allows everything from the simplest task to the most complex image manipulation procedures to be easily scripted. Features and Capabilities This is only a very quickly thrown together list of GIMP features. Customizable Interface Each task requires a different environment and GIMP allows you to customize the view and behavior the way you like it. Starting from the widget theme, allowing you to change colors, widget spacing’s and icon sizes to custom tool sets in the toolbox. The interface is modulized into so called docks, allowing you to stack them into tabs or keep them open in their own window. Pressing the tab key will toggle them hidden. GIMP features a great fullscreen mode allowing you to not only preview your artwork but also do editing work while using the most of your screen estate. Photo Enhancement Numerous digital photo imperfections can be easily compensated for using GIMP. Fix perspective distortion caused by lens tilt simply choosing the corrective mode in the transform tools. Eliminate lens' barrel distortion and vignetting with a powerful filter but a simple interface. The included channel mixer gives you the flexibility and power to get your B/W photography stand out the way you need. Digital Retouching GIMP is ideal for advanced photo retouching techniques. Get rid of unneeded details using the clone tool, or touch up minor details easily with the new healing tool. With the perspective clone tool, it's not difficult to clone objects with perspective in mind just as easily as with the orthogonal clone. Painting Full suite of painting tools including Brush, Pencil, Airbrush, Clone, etc. Sub-pixel sampling for all paint tools for high quality anti-aliasing Extremely powerful gradient editor and blend tool Supports custom brushes and patterns System Tile based memory management so image size is limited only by available disk space Virtually unlimited number of images open at one time Advanced Manipulation Full alpha channel support Layers and channels Multiple Undo/Redo (limited only by diskspace) Editable text layers Transformation tools including rotate, scale, shear and flip Selection tools including rectangle, rounded rectangle, ellipse, free, fuzzy Foreground extraction tool Advanced path tool doing bezier and polygonal selections. Transformable paths, transformable selections. Quickmask to paint a selection. Extensible A Procedural Database for calling internal GIMP functions from external programs as in Script-fu Advanced scripting capabilities (Scheme, Python, Perl) Plug-ins which allow for the easy addition of new file formats and new effect filters Over 100 plug-ins already available Animation Load and save animations in a convenient frame-as-layer format MNG support Frame Navigator (in GAP, the GIMP Animation Package) Onion Skin (in GAP, the GIMP Animation Package) Bluebox (in GAP, the GIMP Animation Package) File Handling File formats supported include bmp, gif, jpeg, mng, pcx, pdf, png, ps, psd, svg, tiff, tga, xpm, and many others Load, display, convert, save to many file formats SVG path import/export Much, much more BONUS PROGRAMS 1. 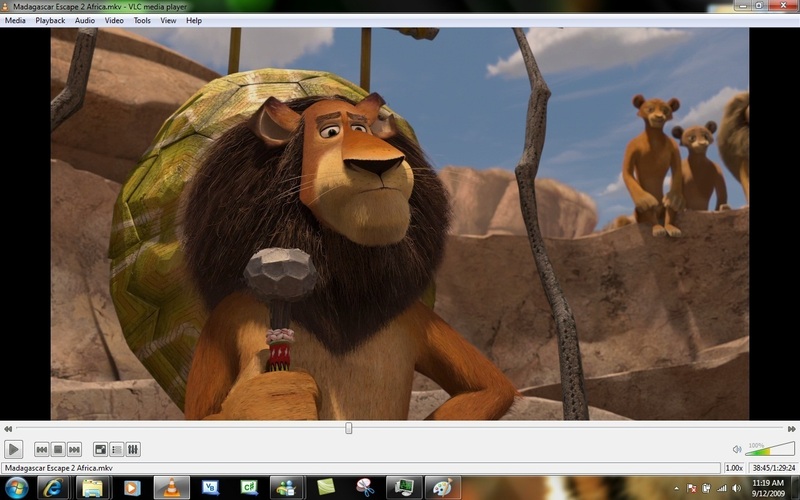 VLC Media Player VLC is superior to Windows Media Player in many areas such as: Input Media, Input formats, Etc… It’s a better more full featured software that’s easier to use than WMP! Features Simple, Powerful and Fast Media Player Plays everything, Files, Discs (DVD, CD, VCD, Blu-Ray), Webcams and Streams Plays most video formats with no codec packs needed: MPEG-2, H.264, DivX, MPEG-4, MKV, WebM, WMV Works on most platforms: Windows, Linux, Mac OS X, Unix... Completely Free, 0 Spyware, Ads or User Tracking Media Converter and Streamer 2. ClamWin Antivirus A Great Alternative to Norton, Kaspersky, McAfee Free for Life with no Renewal/License Headaches to deal with! 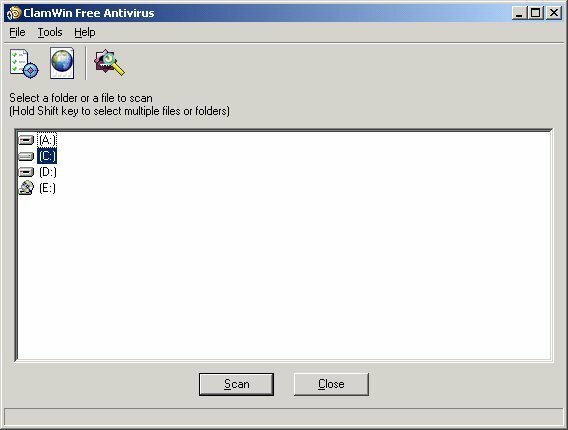 Free Antivirus for Windows. Includes virus scanner, scheduler, virus database updates, context menu integration to MS Windows Explorer and Add in to MS Outlook. Also features an easy setup program. Uses a well-respected ClamAV scanning engine. ClamWin is a Free Antivirus program for Microsoft Windows 7 / Vista / XP / Me / 2000 / 98 and Windows Server 2008 and 2003. ClamWin Free Antivirus is used by more than 600,000 users worldwide on a daily basis. It comes with an easy installer and open source code. It features: High detection rates for viruses and spyware; Scanning Scheduler; Automatic downloads of regularly updated Virus Database. Standalone virus scanner and right-click menu integration to Microsoft Windows Explorer; Add in to Microsoft Outlook to remove virus-infected attachments automatically. How often is the virus database updated? The virus database is usually updated several times a day. 3. Open Office Supports Microsoft Word, Excel, PowerPoint File Formats! 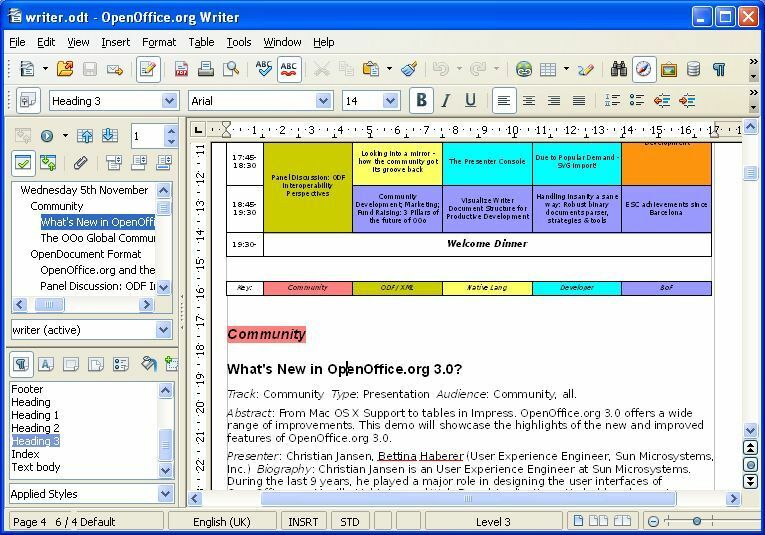 OpenOffice.org 3 - Product Description Compatible with other major office suites, OpenOffice.org is free to use, and distribute. · Writer – a word processor you can use for anything from writing a quick letter to producing an entire book. · Calc – a powerful spreadsheet with all the tools you need to calculate, analyze, and present your data in numerical reports or sizzling graphics. · Impress – the fastest, most powerful way to create effective multimedia presentations. · Draw – lets you produce everything from simple diagrams to dynamic 3D illustrations. · Base – lets you manipulate databases seamlessly. Create and modify tables, forms, queries, and reports, all from within OpenOffice.org · Math – lets you create mathematical equations with a graphic user interface or by directly typing your formulas into the equation editor. OpenOffice.org is Easy to Use The software looks and feels familiar and is instantly usable by anyone who has used a competitive product It’s easy to work with to OpenOffice.org - the software is compatible with the major competitors’ files. 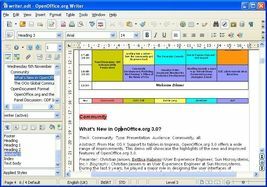 OpenOffice.org is Free Software! You may install OpenOffice.org completely free of any license fees Install it on as many PCs as you like Use it for any purpose - private, educational, government and public administration, commercial... Pass on copies free of charge to family, friends, students, employees, etc… 4. KeePass Password Safe What is KeePass? Today you need to remember many passwords. You need a password for the Windows network logon, your e-mail account, your website's FTP password, online passwords (like website member accounts), etc... The list is endless. Also, you should use different passwords for each account. Because if you use only one password everywhere and someone gets this password you have a problem... A very serious problem. The thief would have access to your e-mail account, website, etc… Unimaginable. KeePass is a free open source password manager, which helps you to manage your passwords in a secure way. You can put all your passwords in one database, which is locked with one master key or a key file. So you only have to remember one single master password or select the key file to unlock the whole database. The databases are encrypted using the best and most secure encryption algorithms currently known (AES and Twofish). Is it really free? Yes, KeePass is really free, and more than that: it is open source (OSI certified). You can have a look at its full source and check whether the encryption algorithms are implemented correctly. Features · Strong Security · Multiple User Keys · Portable and No Installation Required, Accessibility · Export To TXT, HTML, XML and CSV Files · Import from Many File Formats · Easy Database Transfer · Support of Password Groups · Time Fields and Entry Attachments · Auto-Type, Global Auto-Type Hot Key and Drag Drop · Intuitive and Secure Clipboard Handling · Searching and Sorting · Multi-Language Support · Strong Random Password Generator · Plugin Architecture 5. DVDStyler DVDStyler is a cross-platform free DVD authoring application for the creation of professional-looking DVDs. It allows not only burning of video files on DVD that can be played practically on any standalone DVD player, but also creation of individually designed DVD menus. Compare to Nero or Roxio. Features create and burn DVD video with interactive menus design your own DVD menu or select one from the list of ready to use menu templates v1.8.0 create photo slideshow add multiple subtitle and audio tracks support of AVI, MOV, MP4, MPEG, OGG, WMV and other file formats support of MPEG-2, MPEG-4, DivX, Xvid, MP2, MP3, AC-3 and other audio and video formats support of multi-core processor use MPEG and VOB files without re-encoding put files with different audio/video format on one DVD (support of titleset) user-friendly interface with support of drag drop flexible menu creation on the basis of scalable vector graphic import of image file for background place buttons, text, images and other graphic objects anywhere on the menu screen change the font/color and other parameters of buttons and graphic objects scale any button or graphic object copy any menu object or whole menu customize navigation using DVD scripting ****This is not a boot limited, OEM, shareware, bootleg or trial version, No activation or CD key is required to take full advantage of this software. CD-ROM set does not come in a retail box as it is Open Source software. Installation is as simple as inserting the CD in your computer. All the software programs included in this listing and included on these CD-ROM's are Open Source, not "freeware" or “shareware", and fall under the terms of the GNU Public License, and the GNU Lesser General Public License (LGPL). No copyright or trademark laws have been infringed. This product is in full compliance and full accordance to Media Policy and Unauthorized Copies Policy. Thanks for Looking! Please listing with confidence, I only sell items that I would be proud to purchase myself!